For rotating equilibrium ellipsoid, see Jacobi ellipsoid. An ellipsoid is a surface that may be obtained from a sphere by deforming it by means of directional scalings, or more generally, of an affine transformation. An ellipsoid is a quadric surface; that is, a surface that may be defined as the zero set of a polynomial of degree two in three variables. Among quadric surfaces, an ellipsoid is characterized by either of the two following properties. Every planar cross section is either an ellipse, or is empty, or is reduced to a single point (this explains the name, meaning "ellipse like"). It is bounded, which means that it may be enclosed in a sufficiently large sphere. An ellipsoid has three pairwise perpendicular axes of symmetry which intersect at a center of symmetry, called the center of the ellipsoid. The line segments that are delimited on the axes of symmetry by the ellipsoid are called the principal axes, or simply axes of the ellipsoid. If the three axes have different lengths, the ellipsoid is said to be tri-axial or (rarely) scalene, and the axes are uniquely defined. If two of the axes have the same length, then the ellipsoid is an "ellipsoid of revolution", also called a spheroid. In this case, the ellipsoid is invariant under a rotation around the third axis, and there are thus infinitely many ways of choosing the two perpendicular axes of the same length. If the third axis is shorter, the ellipsoid is an oblate spheroid; if it is longer, it is a prolate spheroid. If the three axes have the same length, the ellipsoid is a sphere. where a, b, c are positive real numbers. The points (a, 0, 0), (0, b, 0) and (0, 0, c) lie on the surface. The line segments from the origin to these points are called the principal semi-axes of the ellipsoid, because a, b, c are half the length of the principal axes. They correspond to the semi-major axis and semi-minor axis of an ellipse. is the azimuth angle of the point (x, y, z) of the ellipsoid. Note that this equation reduces to that of the volume of a sphere when all three elliptic radii are equal, and to that of an oblate or prolate spheroid when two of them are equal. the volume of the circumscribed box. and where F(φ,k) and E(φ,k) are incomplete elliptic integrals of the first and second kind respectively. can be used to calculate the surface area of a prolate ellipsoid and vice versa). 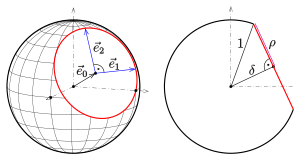 In both cases e may again be identified as the eccentricity of the ellipse formed by the cross section through the symmetry axis. (See ellipse). Derivations of these results may be found in standard sources, for example Mathworld. Here p ≈ 1.6075 yields a relative error of at most 1.061%; a value of p = 8/5 = 1.6 is optimal for nearly spherical ellipsoids, with a relative error of at most 1.178%. In the "flat" limit of c much smaller than a, b, the area is approximately 2πab, equivalent to p ≈ 1.5850. The intersection of a plane and a sphere is a circle (or is reduced to a single point, or is empty). Any ellipsoid is the image of the unit sphere under some affine transformation, and any plane is the image of some other plane under the same transformation. So, because affine transformations map circles to ellipses, the intersection of a plane with an ellipsoid is an ellipse or a single point, or is empty. Obviously, spheroids contain circles. This is also true, but less obvious, for triaxial ellipsoids (see Circular section). which have an ellipse in common. , which were wanted for the parametric representation of the intersection ellipse. How to find the vertices and semi-axes of the ellipse is described in ellipse. 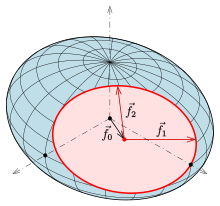 where A is a positive definite matrix and x, v are vectors.
. An invertible linear transformation applied to a sphere produces an ellipsoid, which can be brought into the above standard form by a suitable rotation, a consequence of the polar decomposition (also, see spectral theorem). If the linear transformation is represented by a symmetric 3-by-3 matrix, then the eigenvectors of the matrix are orthogonal (due to the spectral theorem) and represent the directions of the axes of the ellipsoid; the lengths of the semi-axes are computed from the eigenvalues. The singular value decomposition and polar decomposition are matrix decompositions closely related to these geometric observations. An ellipsoid is an affine image of the unit sphere. are the semi principal axes. Earth ellipsoid, a mathematical figure approximating the shape of the Earth. Reference ellipsoid, a mathematical figure approximating the shape of planetary bodies in general. Poinsot's ellipsoid, a geometrical method for visualizing the torque-free motion of a rotating rigid body. Another approach uses MacCullagh ellipsoid. Lamé's stress ellipsoid, an alternative to Mohr's circle for the graphical representation of the stress state at a point. Manipulability ellipsoid, used to describe a robot's freedom of motion. Index ellipsoid, a diagram of an ellipsoid that depicts the orientation and relative magnitude of refractive indices in a crystal. Thermal ellipsoid, ellipsoids used in crystallography to indicate the magnitudes and directions of the thermal vibration of atoms in crystal structures. these moments of inertia reduce to those for a sphere of uniform density. 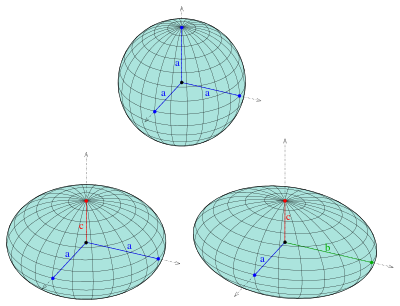 Ellipsoids and cuboids rotate stably along their major or minor axes, but not along their median axis. This can be seen experimentally by throwing an eraser with some spin. In addition, moment of inertia considerations mean that rotation along the major axis is more easily perturbed than rotation along the minor axis. 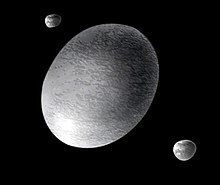 One practical effect of this is that scalene astronomical bodies such as Haumea generally rotate along their minor axes (as does Earth, which is merely oblate); in addition, because of tidal locking, moons in synchronous orbit such as Mimas orbit with their major axis aligned radially to their planet. A spinning body of homogeneous self-gravitating fluid will assume the form of either a Maclaurin spheroid (oblate spheroid) or Jacobi ellipsoid (scalene ellipsoid) when in hydrostatic equilibrium, and for moderate rates of rotation. At faster rotations, non-ellipsoidal piriform or oviform shapes can be expected, but these are not stable. The ellipsoid is the most general shape for which it has been possible to calculate the creeping flow of fluid around the solid shape. The calculations include the force required to translate through a fluid and to rotate within it. Applications include determining the size and shape of large molecules, the sinking rate of small particles, and the swimming abilities of microorganisms. Thus the density function is a scalar-to-scalar transformation of a quadric expression. Moreover, the equation for any iso-density surface states that the quadric expression equals some constant specific to that value of the density, and the iso-density surface is an ellipsoid. The volume of a higher-dimensional ellipsoid (a hyperellipsoid) can be calculated using the dimensional constant given for the volume of a hypersphere. One can also define hyperellipsoids as the images of spheres under invertible linear transformations. The spectral theorem can again be used to obtain a standard equation akin to the one given above. Flattening, also called ellipticity and oblateness, is a measure of the compression of a circle or sphere along a diameter to form an ellipse or an ellipsoid of revolution (spheroid), respectively. ^ F. W. J. Olver, D. W. Lozier, R. F. Boisvert, and C. W. Clark, editors, 2010, NIST Handbook of Mathematical Functions (Cambridge University Press), available on line at "Archived copy". Archived from the original on 2012-12-02. Retrieved 2012-01-08. CS1 maint: Archived copy as title (link) (see next reference). ^ W., Weisstein, Eric. "Prolate Spheroid". mathworld.wolfram.com. Archived from the original on 3 August 2017. Retrieved 25 March 2018. ^ Final answers Archived 2011-09-30 at the Wayback Machine by Gerard P. Michon (2004-05-13). See Thomsen's formulas and Cantrell's comments. ^ "Archived copy" (PDF). Archived (PDF) from the original on 2013-06-26. Retrieved 2013-10-12. CS1 maint: Archived copy as title (link) pp. 17–18. ^ Computerunterstützte Darstellende und Konstruktive Geometrie. Archived 2013-11-10 at the Wayback Machine Uni Darmstadt (PDF; 3,4 MB), S. 88. ^ Bezinque, Adam; et al. "Determination of Prostate Volume: A Comparison of Contemporary Methods". Academic Radiology. doi:10.1016/j.acra.2018.03.014. PMID 29609953. Retrieved 16 May 2018. ^ Goldstein, H G (1980). Classical Mechanics, (2nd edition) Chapter 5. ^ Dusenbery, David B. (2009).Living at Micro Scale, Harvard University Press, Cambridge, Massachusetts ISBN 978-0-674-03116-6. ^ Frahm, G., Junker, M., & Szimayer, A. (2003). Elliptical copulas: applicability and limitations. Statistics & Probability Letters, 63(3), 275–286. Wikimedia Commons has media related to Ellipsoids. "Ellipsoid" by Jeff Bryant, Wolfram Demonstrations Project, 2007. Ellipsoid and Quadratic Surface, MathWorld.